Roger Bacon, the son of a wealthy landowner, was born in Ilchester, Somerset in about 1214. He studied at Oxford University and eventually gained a reputation for a deep knowledge of philosophy and alchemy. Bacon devoted himself to experimental science and became known as Doctor Mirabilis (Wonderful Teacher). In 1247 Bacon became a Franciscan friar. Bacon was probably the most important scholar of the Middle Ages and wrote a great number of books on a wide variety of subjects. This included On the Marvellous Power of Art and Nature, On Mirrors, Metaphysical and On the Multiplication of Species. In his books he speculated about flying machines, mechanical transport, diving apparatus, the circumnavigation of the globe, a pulley system, and the construction of microscopes and telescopes. 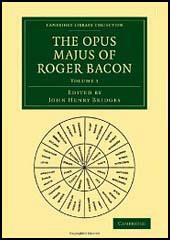 Bacon's most important book was Opus Majus (Great Work). This 840 page book was a compendium of all aspects of knowledge obtained by Bacon. This was followed by Opus Minus (Lesser Work). This book included an attack on the Church. He argued that in "every town, in every village... there is an infinite corruption, beginning with the highest level." He claimed that priests were eager to "enrich themselves indifferent to the care of souls... the monks, in their turn, are no better, and I exempt no Order." Bacon had gone too far and in 1277 he was sent to prison for heresy. Bacon was chained up in a tiny cell for seventeen years. During this period he managed to write only one book, Collected Study of Philosophy. 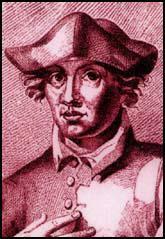 Roger Bacon was released from prison just a few months before his death on 11th June, 1294. Similarly it is possible to construct a small-sized instrument for elevating and depressing great weights, a device which is most useful in certain exigencies. The wonders of refracted vision are still greater; for it is easily shown by the rules stated above (demonstrating the workings of lenses) that very large objects can be made to appear small, and the reverse, and very distant objects will seem very close at hand, and conversely. For we can so shape transparent bodies, and arrange them in such a way with respect to our sight and objects of vision, that the rays will be refracted and bent in any direction that we desire, and under any angle we wish we shall see the object near or at a distance. We see that two herbs grow out of the ground at the same time without anything in common, and for this reason twins in the womb of their mother receive a lot of difference in nature, so that afterwards they have different manners, and follow different arts and occupations through their lives. He who is ignorant of mathematics cannot know the other sciences and the things of this world . . . Moreover, what is worse, men who arc ignorant of mathematics do not perceive their ignorance, and therefore seek no remedy. While, on the other hand, knowledge of this science prepares the mind and elevates it to a sure knowledge of all things, so that if it perceives the roots of wisdom which surround this science and applies these roots to an inquiry into other sciences and things, then it will be able to know all things in sequence without doubt or error, and in case and power. There are two modes of acquiring knowledge, namely by reasoning and experience. Reasoning draws a conclusion . . . but does not make the conclusion certain, nor does it remove doubt so that the mind may be confident it has reached the truth, unless the mind discovers (the conclusion) by the path of experience. From the flashing and flaming of certain igneous mixtures and the terror inspired by their noise wonderful consequences ensue. As a simple example may be mentioned: the noise and flame generated by the powder, known in divers places, composed of saltpetre, charcoal, and sulphur. When a quantity of the powder no bigger than a man's finger is wrapped up in a piece of parchment and ignited, it explodes with a blinding flash and a stunning noise. If a larger quantity were used, or if the case were made of some solid material, the explosion would of course be much more violent and the flash and din altogether unbearable.